Matt Johnston of Australia has won the 2016-17 Virtual Vendée Globe Edition sailing event. It was a very tight race that the virtual sailors had to go through and the distance covered by the virtual sailors was 49,000 km. It took about 72 days and a bit of Matt Johnston to virtually sail all over the world in his black and yellow boat. Finally, he won the virtual sailing race and arrived ahead of 451,000 other virtual sailors. 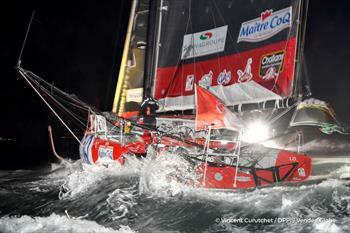 The Virtual Vendée Globe Edition started and ended at Les Sables d’Olonne. Matt Johnston and his Mangina-PYR boat were in the 540th position at the first of the three major capes in this virtual sailing race and that was at the Cape of Good Hope. He and his boat rallied past a lot of other virtual sailors to 288th at Cape Leeuwin, 1423nd at Cape Horn and entered the northern hemisphere in the 12th position. Through these 72 days, Johnston had to do a lot of work like fine tuning his boat, choosing the best routes to sail and also have a close eye on the weather and its pattern. Matt achieved this circumnavigation in 72 days and this is 2 days and 10 hours better timing than the former Lilian Launay’s reference race time. Johnston had sailed a total of 26,592.20 nautical miles at an average speed of 15, 4 knots. Matt said that his taking part with Michael Coxon in a sailing championship helped him in this virtual regatta. He got a lot of advice and sailing tips from Coxon. The experience made him realize the importance of going as fast as possible at different situations and phases. He said that he tried to do what he was taught to do and this helped him in winning the Virtual Vendee Globe.